Mop fly mania history began in the late 90’s in Western North Carolina. Jim Estes began using the mop material on fly patterns here when the material first came available at a Dollar Store in Bryson City, North Carolina. Jim and I have been friends since the mid-1980’s and one thing I can tell you about him is that he is one of the most experimental fly fishers that I know. Not just the mop material used in tying but we have played around with homemade fly lines, liquids and pastes for floating or sinking mono, and many other obscurities in the sport of fly fishing. In the late 90’s the bright green “mop fly” was a very good representation of the larger sourwood worms that fell from the trees in June through August in this part of the country. Before the mop material came about we would use coffee grinders to get the perfect color green and a dubbing loop to represent these terrestrial worms. Today you will see folks with variations of the pattern all over the world. Why? Because regardless of your thoughts about the pattern it is a highly productive fly at times with the added benefit that it is one of the fastest patterns to create. It has quickly become a favorite “guides” choice pattern because of the simplicity to produce. One of the best quotes I remember from my friend Lefty Kreh was “folks either steal or share information”. He had seen it all during his time in the fly fishing industry. Lefty used the story of Norman Duncan who invented the Duncan Loop in the Florida Keys in the early 1960’s. Norman showed it to a neighbor and a month later it was published as a new knot called the “Uni Knot”. A few months later it goes to Europe as a “Grinner Knot”. How convenient that Norman was never mentioned in any of these! He shared it with others for others to exploit. One of the big keys to success for Western Carolina fly fishers is that many do share information. The successes in this region could have never taken place otherwise. From knots, patterns, casting techniques, line retrievals, solutions of paste, and many other facets for fly fishing. Hard to be a fan of those that take without due credit. This is more common today (entitlement crowds) than ever before. In all honesty, I think it is quite laughable many of the designer patterns in catalogs today. There is no doubt we could produce a box for my region of the country with less than a dozen patterns that would excel all over the globe. Far too many buy into the allure that their success and failure is due to fly pattern. Without question the majority of the time it is due to the angler. These “big chain” fly suppliers like to appeal more to those that have not figured that out yet. Jim Estes submitted his creation to Umpqua Feather Merchants in Colorado. Umpqua and Montana Fly Company are among the few big players for commercial patterns. It was declined because as he was informed “it was a regional pattern”. 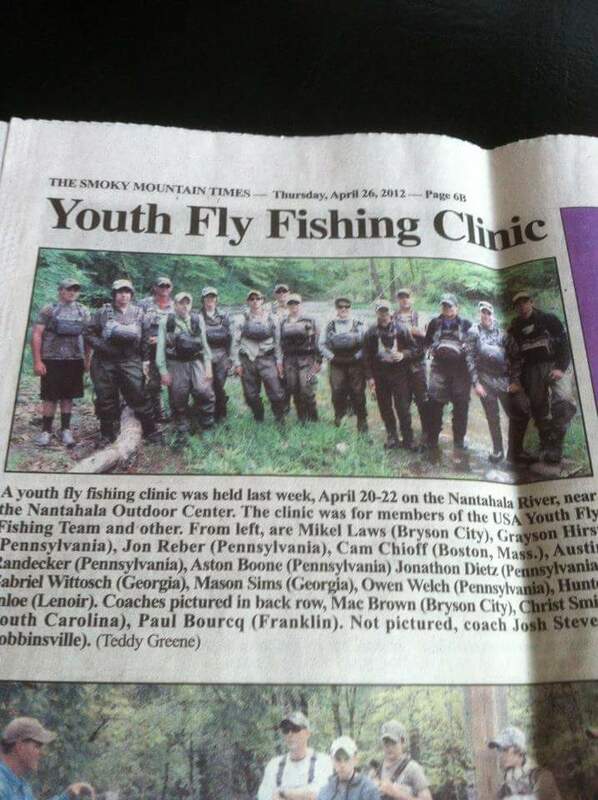 This was ironic in a way because it had already won multiple individual, as well as, Fly Fishing Team USA Youth Gold medals in Europe. It was already proven in Patagonia, New Zealand, Chile, and many other exotic trout fishing destinations. Now it is in their 2018 catalog called the Umpqua Mop. Point is just a few short years ago all kinds of credit was given for articulation of a singular pattern. Articulation is nothing new! I remember nymphs and streamers articulated when I was a teenager. 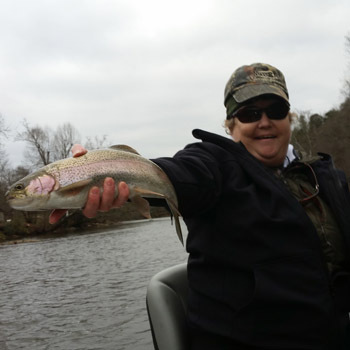 Bryson City has had many renowned fly fishers from Europe visit during either competition or training for the Team USA Youth or North Carolina Team. October 2016 it was featured in the London Times and the Wall Street Journal. The mop is no doubt one of the most popular patterns in the past 30 years for the sport of fly fishing. Making use of new materials as they become available has always been part of the evolution of the sport of fly fishing and fly tying. 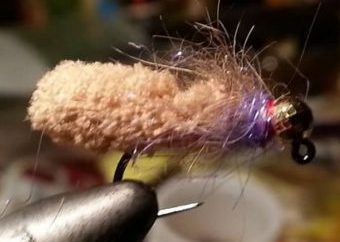 Changing a singular color in back of bead or adding a rubber leg is not an invention of a “new fly”. The concept of a material being used in the first place as a viable pattern is a progress. Many folks think the pattern should be in the “junk food” category along with squirmy worms and egg patterns. Even aquatic worms and eggs occur naturally in the water. So it is a bit confusing why they are considered junk food in the first place. The pink mops look like nothing in the water yet I remember many triple-digit days on guide trips. If you fish lakes often try a mop fly blob. Trout are curious creatures about sampling the drift! I have had many wild brown trout over the years with strange things eaten including okra! Give it a try and I assure you at some point you will become a believer in the mop. It mops fish to the net in a hurry! It will make the history books right up there with Frank Sawyers “Killer Bug” and the “Waltz Worm” from PA. The “Estes mop” is what it should be called down the road out of respect to the originator.